Презентация на тему: "Презентация к уроку по английскому языку (6 класс) по теме: Queen Elizabeth II / Королева Елизавета II". Скачать бесплатно и без регистрации. Применение средств мультимедиа даёт учащимся наглядное представление о событиях из жизни английской королевы Елизаветы II.Представленный материал рекомендуется в качестве дополнительного дидактического материала для проведения урока по теме “Королевская семья” в 6 класс. Презентация позволяет расширить представления учащихся по изучаемой теме.Работа с информационными ресурсами помогает реализовать личностно-ориентированный подход в обучении и способствует развитию коммуникативных и информационных навыков.Цель: представление дополнительного материала по теме “Королевская семья” для развития коммуникативных навыков учащихся.Задачи: расширить представления учащихся по изучаемой теме;прививать любовь к иноязычной культуре.Оборудование:компьютер, мультимедийное оборудование. 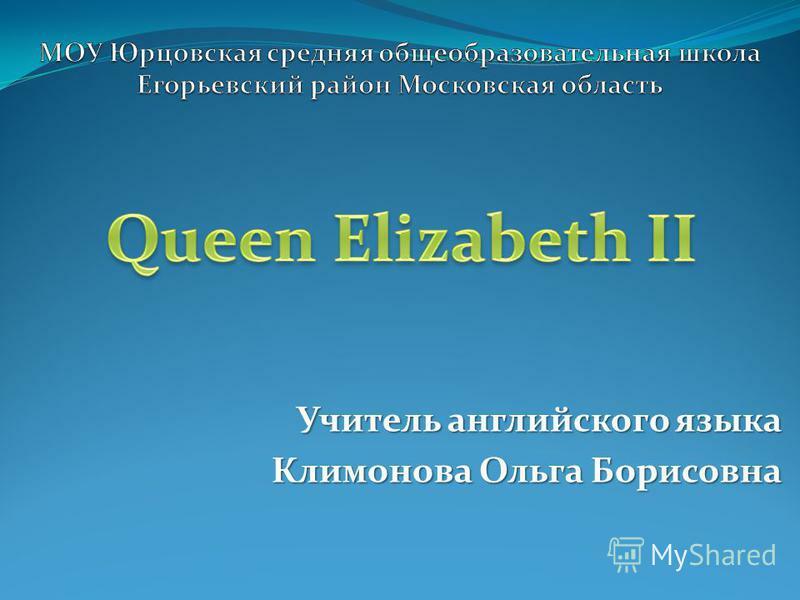 2 Queen Elizabeths full name is Elizabeth Alexandra Mary. 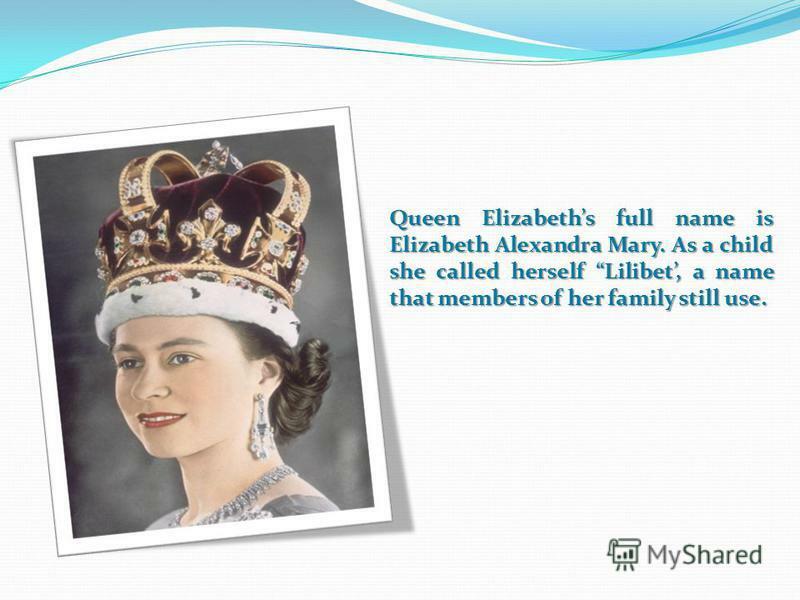 As a child she called herself Lilibet, a name that members of her family still use. 3 The Queens surname is Windsor. 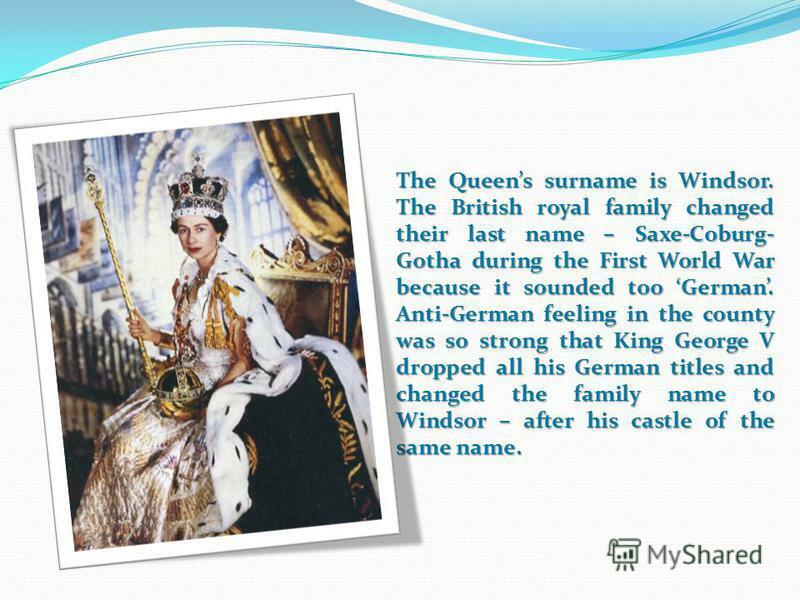 The British royal family changed their last name – Saxe-Coburg- Gotha during the First World War because it sounded too German. Anti-German feeling in the county was so strong that King George V dropped all his German titles and changed the family name to Windsor – after his castle of the same name. 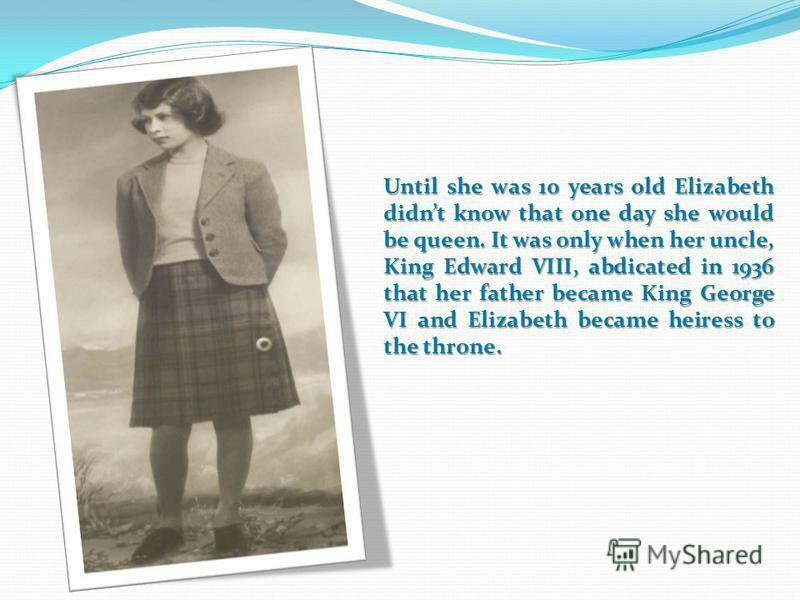 4 Until she was 10 years old Elizabeth didnt know that one day she would be queen. It was only when her uncle, King Edward VIII, abdicated in 1936 that her father became King George VI and Elizabeth became heiress to the throne. 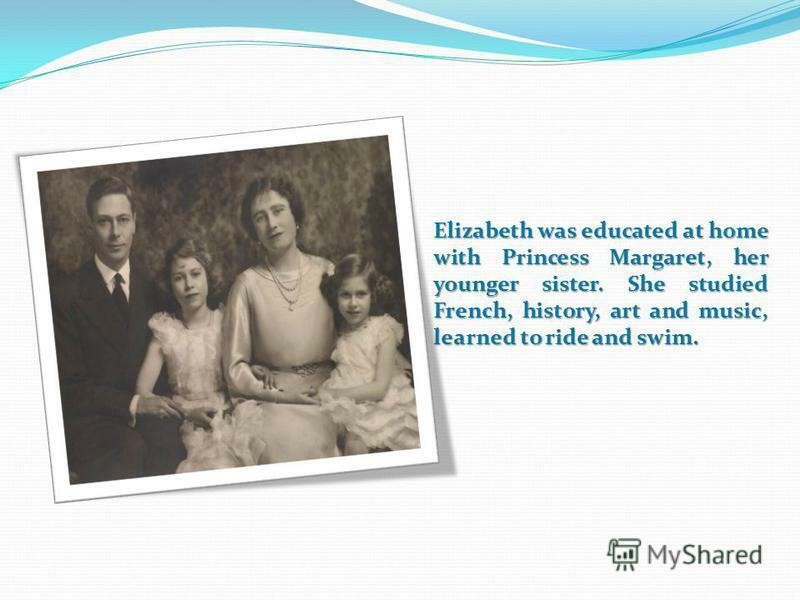 5 Elizabeth was educated at home with Princess Margaret, her younger sister. She studied French, history, art and music, learned to ride and swim. 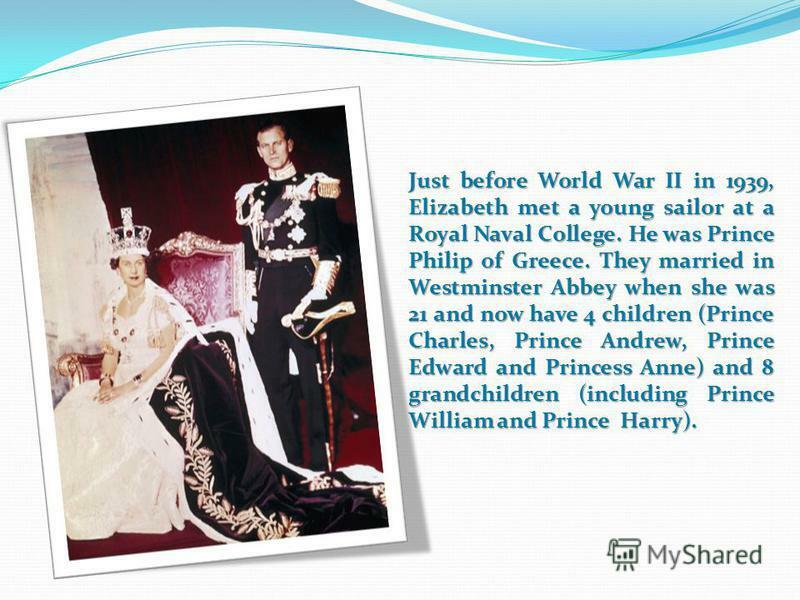 6 Just before World War II in 1939, Elizabeth met a young sailor at a Royal Naval College. He was Prince Philip of Greece. They married in Westminster Abbey when she was 21 and now have 4 children (Prince Charles, Prince Andrew, Prince Edward and Princess Anne) and 8 grandchildren (including Prince William and Prince Harry). 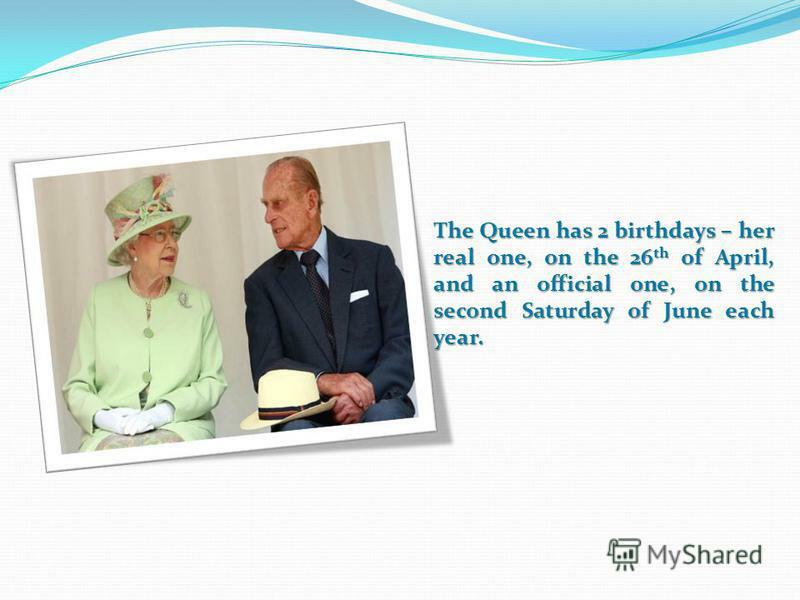 7 The Queen has 2 birthdays – her real one, on the 26 th of April, and an official one, on the second Saturday of June each year. 8 Being Queen is a real busy job. 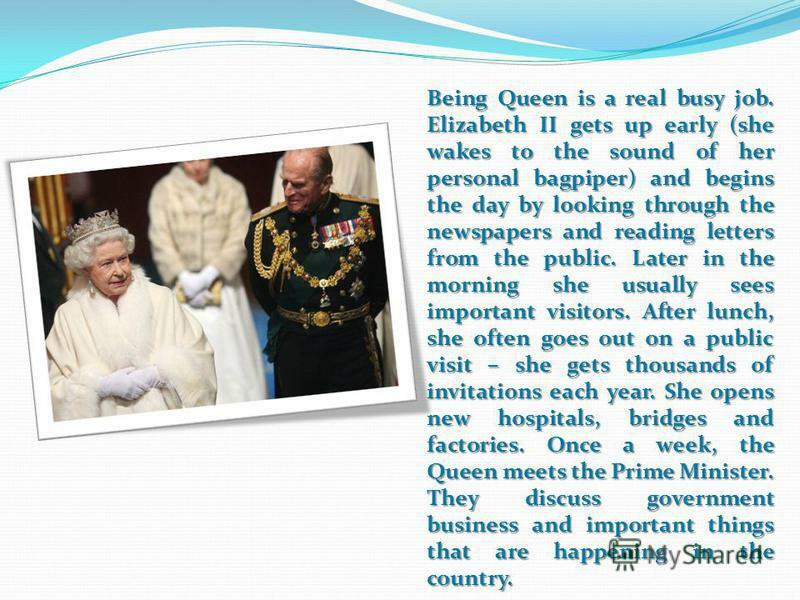 Elizabeth II gets up early (she wakes to the sound of her personal bagpiper) and begins the day by looking through the newspapers and reading letters from the public. Later in the morning she usually sees important visitors. After lunch, she often goes out on a public visit – she gets thousands of invitations each year. She opens new hospitals, bridges and factories. Once a week, the Queen meets the Prime Minister. They discuss government business and important things that are happening in the country. 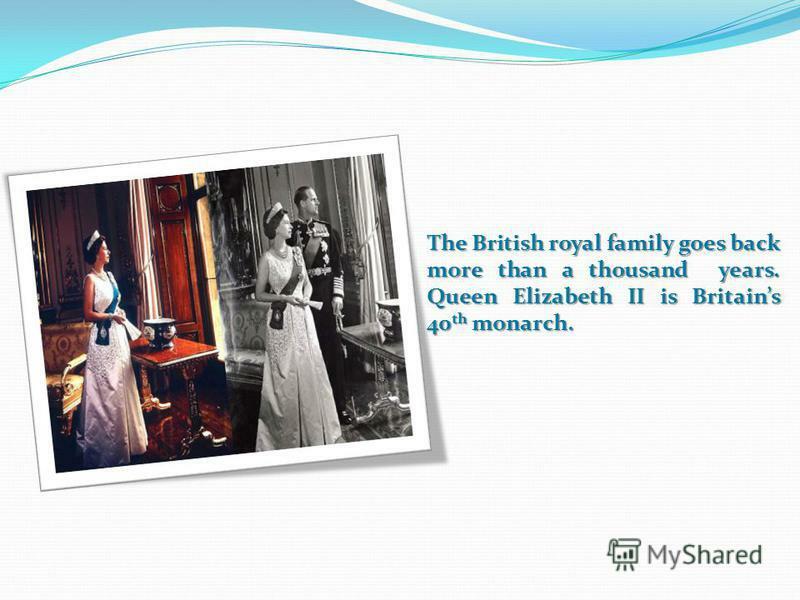 9 The British royal family goes back more than a thousand years. Queen Elizabeth II is Britains 40 th monarch. 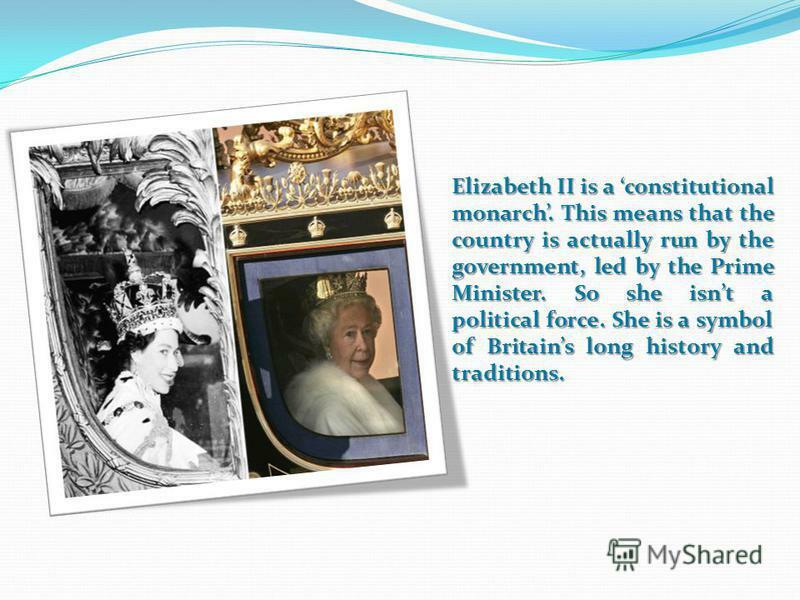 10 Elizabeth II is a constitutional monarch. This means that the country is actually run by the government, led by the Prime Minister. So she isnt a political force. She is a symbol of Britains long history and traditions. 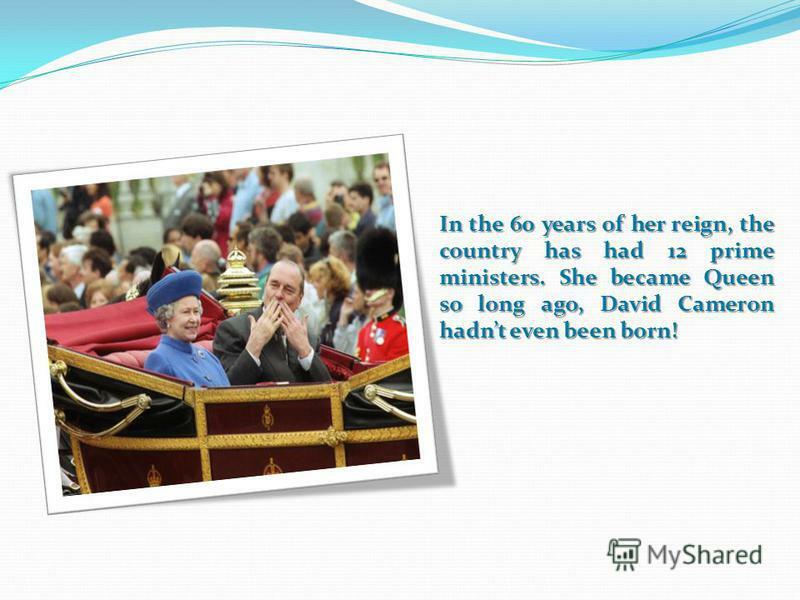 11 In the 60 years of her reign, the country has had 12 prime ministers. She became Queen so long ago, David Cameron hadnt even been born! 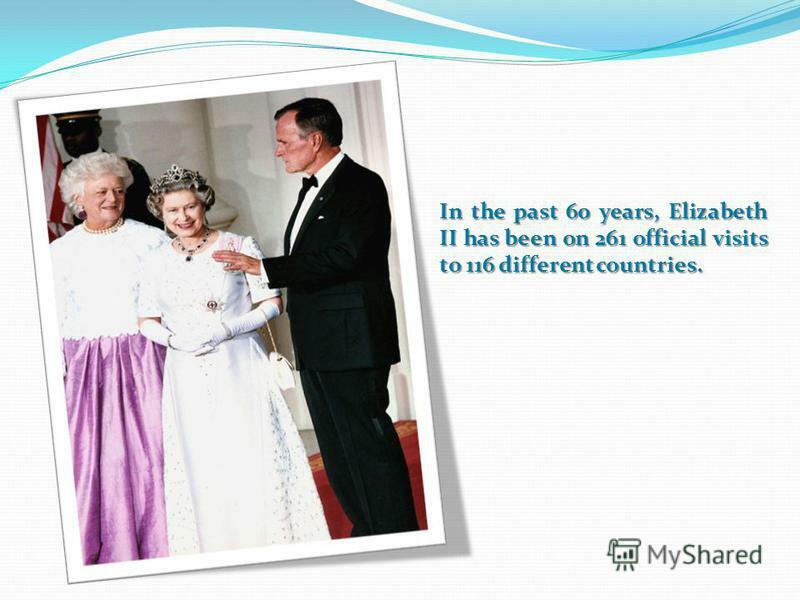 12 In the past 60 years, Elizabeth II has been on 261 official visits to 116 different countries. 13 The Queen in the only person in Great Britain who doesnt have a passport! She is also the only person in the country who can drive without a licence or number plate on her state car. 14 The Queens hobby is photography. 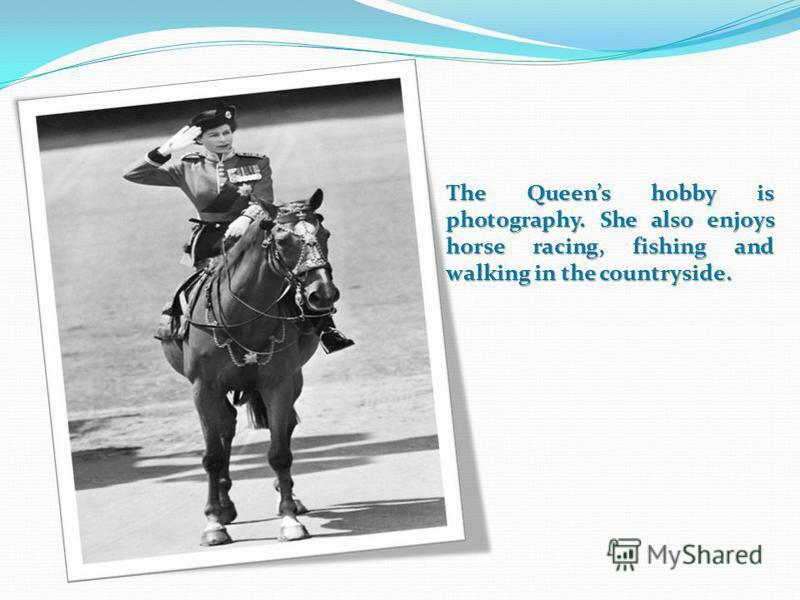 She also enjoys horse racing, fishing and walking in the countryside. 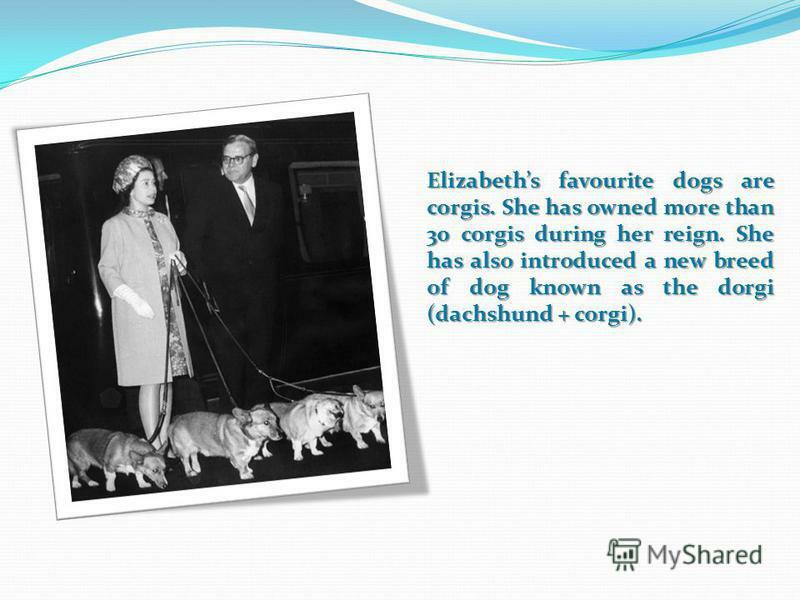 15 Elizabeths favourite dogs are corgis. She has owned more than 30 corgis during her reign. She has also introduced a new breed of dog known as the dorgi (dachshund + corgi). 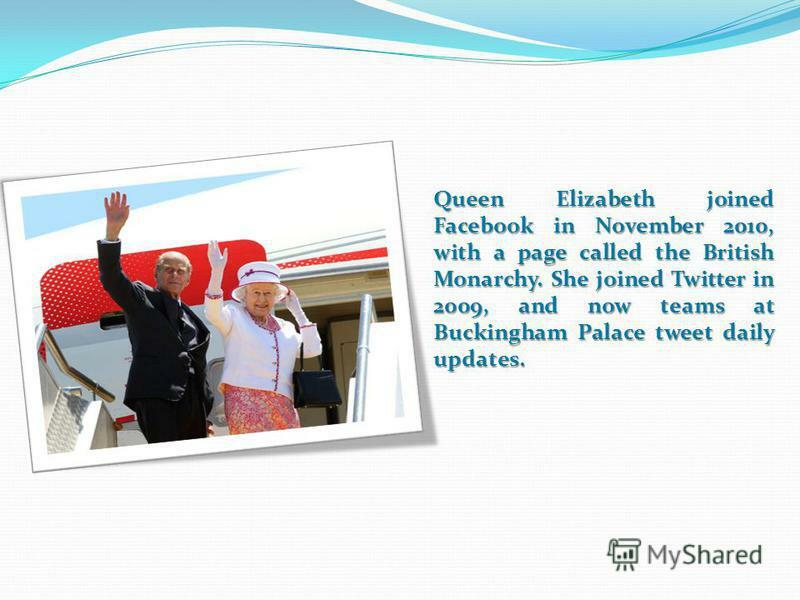 16 Queen Elizabeth joined Facebook in November 2010, with a page called the British Monarchy. She joined Twitter in 2009, and now teams at Buckingham Palace tweet daily updates. 17 The Queen has many hats, because she always wears one when she is out on royal visits. She has worn more than 5,000 different hats over the past 60 years. 18 She speaks French very well and often uses the language during her state visits. 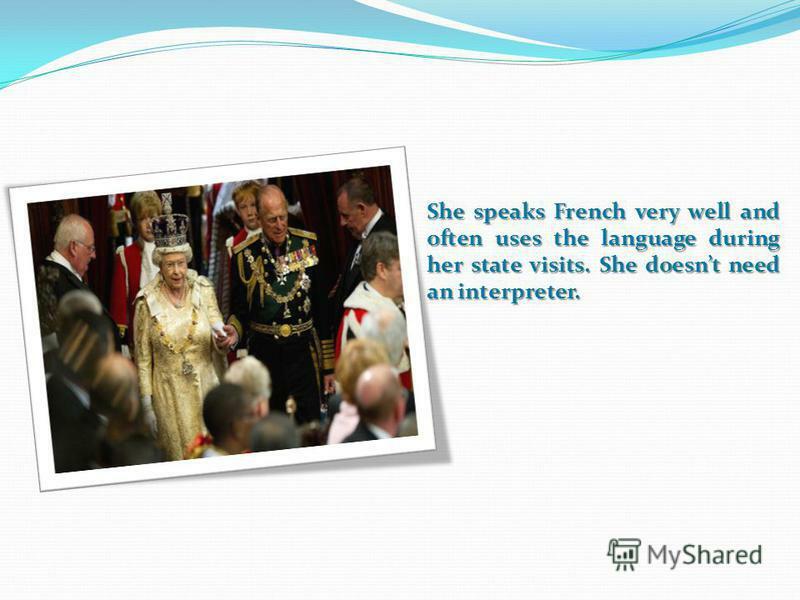 She doesnt need an interpreter. 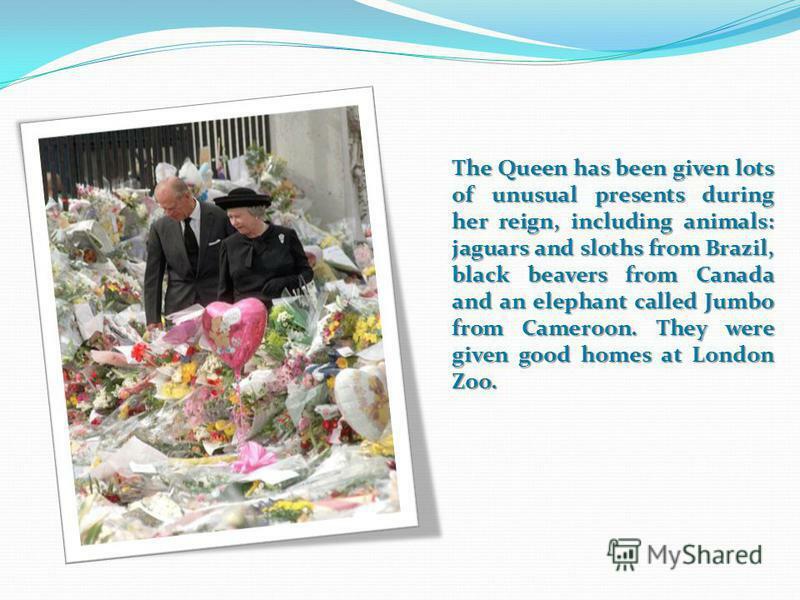 19 The Queen has been given lots of unusual presents during her reign, including animals: jaguars and sloths from Brazil, black beavers from Canada and an elephant called Jumbo from Cameroon. They were given good homes at London Zoo. Queen Elizabeth II: 60 Years on the Throne! Bulatnikov Pyotr Form 7 Never Secondary School February 2013. Elizabeth II - Queen of Great Britain from 1952 to the present. Queen Elizabeth II Her full name is Elizabeth Alexandra Mary. She was born on April 21, 1926. THE MONARCH THE GOVERNMENT THE NON-CABINET THE CABINET THE PRIME MINISTER PARLAMENT The House of Commonce The House of Lords People. London and its places of interest. I What do you know about London? 1. What is the family name of the present royal family? a) Smith b) Tudor c) Stuart d) Windsor. Potapova Ann. Christmas is one of the happiest and busiest times of the year for million of people all over the world. They observe the holiday with religious. BRITISH TRADITIONS Every country has its own traditions and customs. In Britain traditions play a very important role in the life of people. The British. 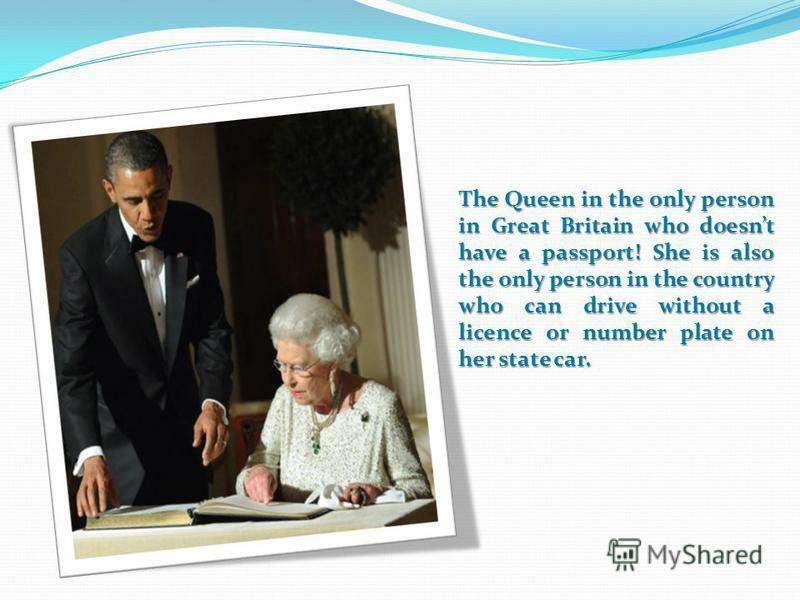 1.Who is the queen of England? 2.What is her full name? 3.When and where was she born? 4.How old is she now? 5.How many years has been ruling Britain? What is the family name of the present royal family? a) Smith b) Tudor c) Stuart d) Windsor. The British Royal family. was born, 21 April, 1926 Elizabeth Alexandra Mary 145, Piccadilly, London. About Britain. Some Views on Учитель английского языка МОУ «СОШ» п.Подтыбок Казаринова Ольга Анатольевна. Презентацію підготувала учениця 10 класу: Жернова Є.О.